The Flying Telescoop - 国鉄よ永遠に / JNR forever! 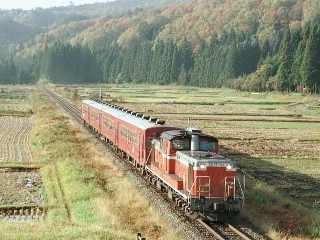 Japan National Railways, abbreviated JNR, had provided a national railway network in Japan until it wasdevided and privatized to Japan Railways group in 1987. This is a gallery focusing to JNR. 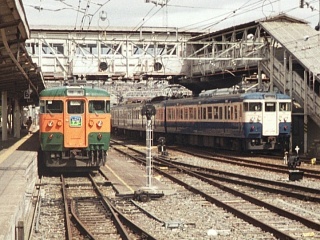 (Left) Those EMU rolling stocks manifactured before 101 series were called "old type". 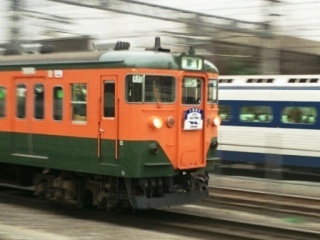 Kumoha-12 type EMU was also one of old type series. Photo at Tsurumi in Apr, 1988. (right) The interior of Kumoha-12 type EMU, wooden flooring and bulb light. Photo in Dec, 1992. 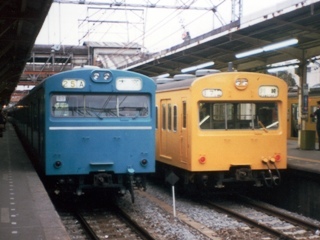 (Left) 101 series EMU, yellow livery in the Nambu Line (right side) and 103 series EMU, sky blue livery in the Kehin-Tohoku Line. 103 series was the largest number of JNR EMU, and served massive commuters in metropolitan are. Photo at Kawasaki in Mar, 1987. 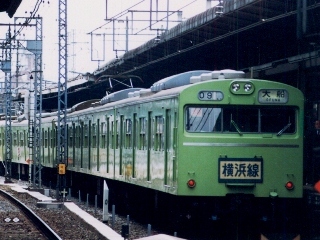 (right) 103 series EMU in the Yokohama Line was in light green livery and had a line name plate at front side. Photo at Yokohama in Jan, 1987. (Left) 103 series EMU in emelard-green livery served in Joban Line. Photo in Jan, 1989 at Matsudo. (right) Sometimes different liveries were mixed. Photo at Shin-Matsudo in Jan, 1978. (left) 201 series EMU on Special rapid service in Chuo Line. It was introduced in 1979, and was the first JNR EMU with electric chopper control which consumes less electricity than 103 series EMU. Photo at Shinjuku in May, 1988. 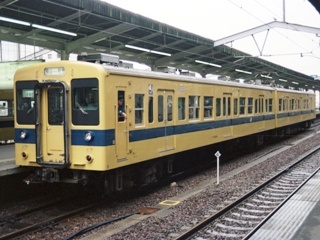 (right) 201 series EMU in yellow livery were placed in Chuo-Sobu local line. Photo at Kinshicho in Jan, 1989. (left) 205 series EMU for Chuo-Sobu local Line (left side) and 103 series EMU 1200 type for through operation of Chuo-Sobu local line and Tokyo subway Tozai-line. Front door is equipped for emergency exit to comply with subway regulation. Photo at Mitaka depot in Sep, 1989. (right) 103 Series EMU 1500 type for through operation of Karatsu line and Fukuoka City subway. Photo at Hakata subway station in Mar, 1989. (Left) A summer special train the "Shiroi Suna" (white sand), by 113 series EMU in original JNR livery with a train name plate. The train departed from Ryogoku station No.3 platform, which is used only for special occasion. Filmed at Ryogoku and Ichikawa in Aug, 2010. (right) EMU. 419 series DC/AC convertible EMU was converted from 581 series sleeper limited express EMU for use of suburban and local services. Therefore, interier of 419 EMU is quite unique and some traces of sleeping facilities can be seen. Filmed in Nov, 2010. (Left) 113 series suburban EMU passing by 165 series EMU on the Express the "Tokai". 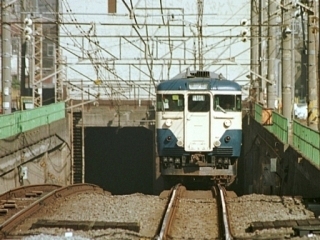 Photo at Tamachi in May, 1988. (right) 113 Series suburban EMU on Yokosuka Line came out from the underground section. Photo at Shinagawa in Nov, 1999. (Left) 113 series EMU with the farewell plate of JNR on the last day of JNR. Photo at Tamachi in Mar, 1987. (right) 113 series EMU lines on the sidlings. Photo at Kinshicho in Aug, 1987. (Left) Difference of livery line can be seen. Photo at Makuhari-Hongo in May, 2010. 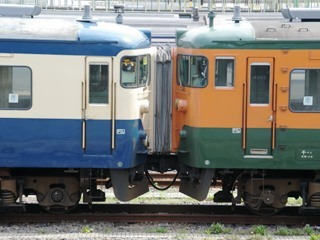 (right) Different liveries were mixed on last days of JNR. Photo at Osaka in Apr, 1987. (left)115 series EMU is derived from 113 series, and equipped enhanced motor and dynamic brake for the operation of highland and cold area. Photo at Koga in Feb, 1987. (Left) 117 EMU was developed for Special Rapid Service in Kansai area. Photo at Osaka in Apr, 1987. (right) 415 series suburban EMU is dual voltage AC/DC convertible. Photo at Kawashima/Yuki in Jan, 2002. (Left) 417 series suburban EMU, dual voltage AC/DC convertible, with dynamic brake and semi-automatic 2 side sliding doors for highland and cold area. Photo at Sendai in Aug, 1988. (right) 711 series AC EMU is designed for Hokkaido area. Photo at Sapporo in Aug, 1988. 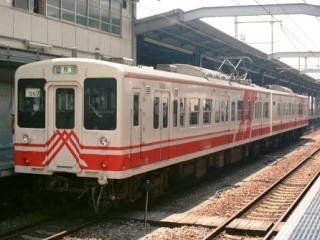 (Left) 105 series EMU was to replace old type EMU in west Japan area. Photo at Fukuyama in May, 1988. (right) 119 series EMU was deployed for frequency service in Shizuoka area. Photo at Shizuoka in Jul, 1987. (Left) Kiha-20 series DMU on Ashio Line. Photo at Sori in Mar, 1988. (right) Kiha-20 series DMU on Moka Line. Photo at Shimodate in Apr 1988. 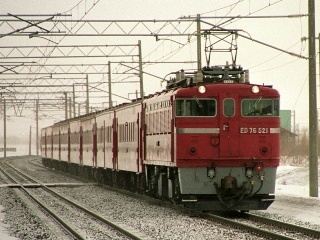 (Left) Kiha-52 series DMU equipped with double engines to enhance power output. 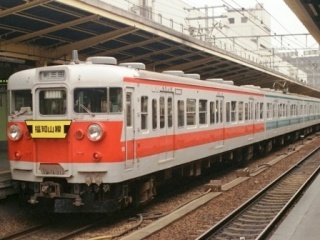 Kiha52-128 was the only car kept the original beige/vermillion JNR diesel car livery. Photo at Kisuki in Mar, 1992. 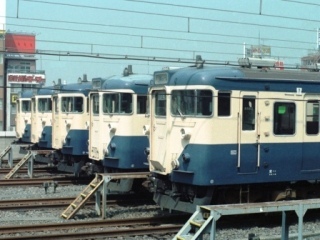 (right) Kiha-53 series DMU also equipped with double engines. Mechanical semaphore signals can be seen. Photo at Izumo-Yokota in Mar 1992. 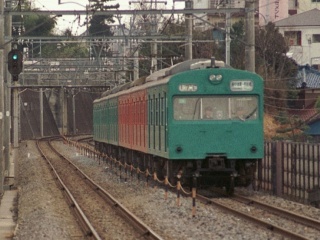 (Left) Kiha-30 series DMU was developed for suburban non-electrified lines. Photo at Takezawa/Orihara in May, 1992. (right) Kiha-58 series express DMU was also used for local trains. Photo at Nakazaike Signal Station in Nov 1993. 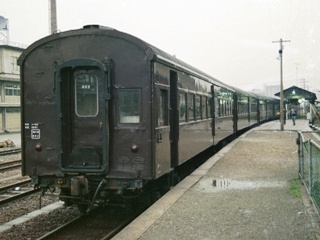 (Left) 65 series old type passenger car for the transporation of factory worker. Photo at Hyogo in Mar, 1988. (right) The interior of 65 series passenger car. Most of chairs were removed to maximize capacity. Photoin Mar, 1988. (Left) 50 series passenger car hauled by ED76 type electric loco. Photo at Toyohoro/Horomui in Mar, 1994. (right) 50 series passenger car hauled by DD51 type diesel loco. Photo at Nozawa/Kaminojiri in Nov, 1995. 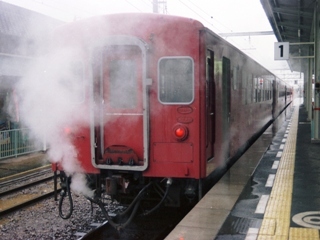 (Left) 50 series passenger car heated by steam. Photo at Sakaide in Mar, 1988. (right) The interior of 50 series passenger car. Photo in Dec, 1991.